Submitted by dave on February 16, 2007 - 4:44pm. 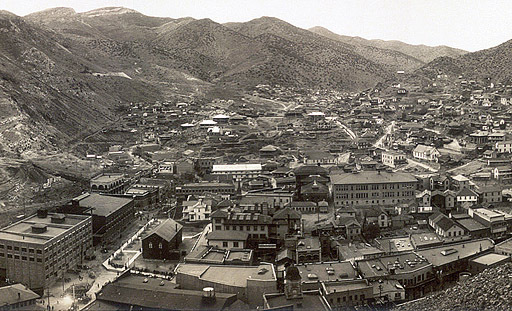 Bisbee, Arizona, in 1909, with the Copper Queen mining operation and smelter just out of view to the left. Click here for a panoramic version of the photo. Greetings to everyone who dropped us a line about this post (and especially all you nice people from New Zealand). If you want to get a feel for the Old West, you canâ€™t do better than travel to Bisbee (or Ouray or Jerome), and stay at the Copper Queen Hotel. (Skip Tombstone, which has turned into a tacky tourist trap.) Architectural note: The Phelps-Dodge Mercantile store visible at center in the panoramic photo behind the train barn burned in 1938 and was replaced the next year by an Art Decoish store designed by Del Webb of Sun City fame.